Mold. The word alone can fill you with dread. Unfortunately, it’s a fact of life in most households. And it especially likes to lurk in your bathroom. The best way to avoid mold is to avoid the conditions where it grows in the first place. Luckily, taking some extra care in your bathroom routine and keeping things clean can do a lot to deter mold growth. It is much harder to get rid of mold than to prevent it. So, we’ve put together some tips to prevent mold from growing in your bathroom. Squeegee water off of shower walls immediately after bathing. This will eliminate about 3/4 of the moisture that can cause mold growth. Run your bathroom fan while bathing. Your fan should be strong enough to clear most of the moisture out of your bathroom in five to 10 minutes. Seal grout around tile once a year. Doing this will waterproof your tile. Sometimes the causes of bathroom moisture can be harder to detect. It can come from hidden sources, like leaks. Leaking sinks and toilets should be repaired right away. They can contribute to mold growth if left alone. If you have extra moisture in your bathroom and you have no idea where it is coming from, you may have a hidden leak behind a wall. This is hard to detect, but it is an excellent magnet for mold spores. Before you tear apart your wall, you may want to call a professional to confirm that a leak exists and finding its source. A pro can use a high tech moisture meter to pinpoint your source of moisture. 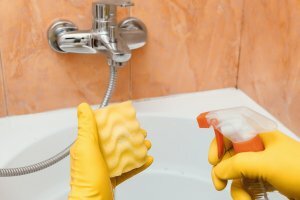 A clean bathroom is a healthy bathroom, especially when it comes to mold. Cleaning your shower regularly will remove the caked-on soap and body oils that mold really enjoy. You also want to keep your drains clear. A clogged drain means water can drain and that will add to the moisture mold loves. Also, avoid leaving damp towels on the floor. Towels, the bathmat and bathroom rug are all breading ground for mold if they are wet and are not cleaned regularly. Sometimes, batting mold on your own just doesn’t cut it. Then it is best to call a professional mold remediation company. If the mold is affecting your health and your cleaning efforts are not helping, it is time to call a professional for effective mold elimination. It is also advisable to use a professional cleaning company when the mold has seeped into walls and insulation, or if you suspect that the heating/ventilation/air conditioning (HVAC) system may be contaminated with mold. You should also call in a pro if you have an area of mold larger than 10 square feet. A remediation company will be best at efficiently tackling these mold situations. 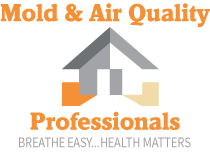 If you need help with mold in your bathroom, be sure to contact Mold & Air Quality Professionals today for a free quote. The sooner you tackle the mold, the better. Let us help you breathe easier.